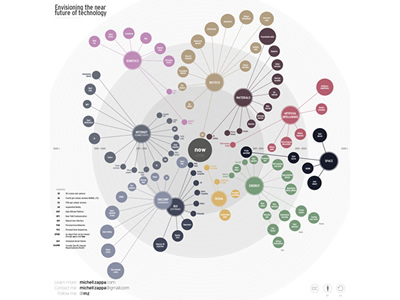 Researched and designed by technologist Michell Zappa, Envisioning Technology is a speculative and subjective overview of potential future technologies. Based on personal research and observations, this map is intended to facilitate predictions of where the technium is going, as well as provoke thought and stimulate debate. 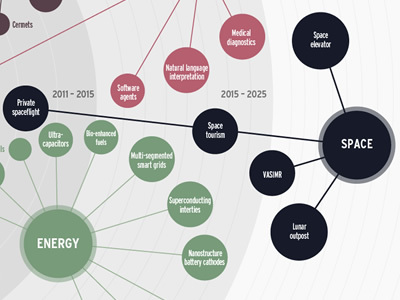 Due to the intrinsic difficulty of speculation, the visualization is not to be interpreted as a roadmap, but rather as a point of reference for those investigating (or designing) the future of technology. Each hub represents an important area of development to which actual technologies (shown as nodes) belong. The center of the map marks where we are today, and the further out points indicate how far into the future each technology is predicted to become mainstream. The visualization also attempts to distinguish the predicted importance of each area, shown by the relative size of the nodes.